The Three Variety Sampler includes one tray each of seedless Navel Oranges, sweet Ruby Red Grapefruit and juicy sweet Florida Tangerines, all fresh harvested and hand packed to order. 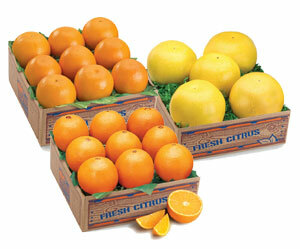 Your fresh fruit gift is then safely delivered to your family and friends in the lower 48 states and Eastern to Canada. Sign up to be notified when Triple Treat Sampler is in season. The Three Variety Sampler is available through January 15 and can be shipped to the lower 48 US states and to Eastern Canada.